There are many reasons why you may be driving without auto insurance. Maybe your last policy was too expensive and you let it lapse, or perhaps you aren't sure what you need to do to get insurance again or where to get it. Whatever the reason that you are driving without insurance, it's very important to get the coverages that you need today. It is illegal to drive without auto insurance and, of course, you want to protect yourself and your family. 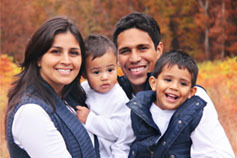 American Access Casualty Company specializes in automobile insurance directed towards the Hispanic community. We can help you get the auto insurance you need now - quickly, conveniently and at a low cost.